Left to right: Deb Kimball Robinson, Bruce McCutcheon, Secretary. Amber Lopez, Vice President. Lou Levesque, Treasurer. Wendy Peskin, President. Steve Peyton. Genevieve Aiona. Gene Hennen. David Penhallow Scott. Owner and Agent of Pacific Island Insurance LLC. Amber was a cast member in both 2014 and 2015 Palace Theater Fall Musicals. I am retired from United Airline and moved to the Big Island in 2013. Having seen many of the old movie gems on the mainland torn down, it’s a joy to see a wonderful treasure as the Palace Theater restored and reused as a community venue for cultural events, such as concerts, play and independent movies. As a newly appointed board member, I’m excited to actively participate in maintaining this piece of Hilo’s history, What I like most about the Palace Theater is it’s architectural beauty and cultural diversity. I joined the Board of Directors of the Palace Theater in December 2015. I am a retired Vice President of Technology from Bank of America. I have been visiting Hilo for over 30 years and after retiring I relocated here in 2013. I look forward to the opportunity to help preserve and improve the historic Palace Theater. Gene Hennen of Hennen Building Co. I arrived in Hilo in 1956 from Micronesia with my parents and 6 younger siblings. I have seen many and much change here in Hilo town and lived through the 1960 Tsunami. My occupations have been varied from toy demonstrator, rental car agent, jobs in the food industry to 13 years at a children’s specialty store. I love working with people especially children. I’m humbly proud that I have the opportunity to help to perpetuate one of Hilo’s famous landmarks …the grand lady of film, theater and music … the Palace Theater. A resident of Hawai’i for 30 years, served as Administrative Director with United States Department of Agriculture for 12 years serving Hawai’i and the Western Pacific. Fifteen years as Assistant Human Resources Director/ Employee Relations Specialist for Hawai’i Health Systems Corporation serving Hilo Medical Center, Honoka’a and Ka’u Hospitals – from which I retired in September 2016. 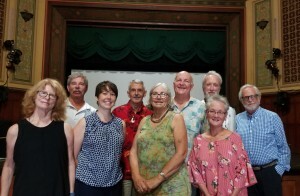 For the past 14 years worked with every community theater organization in Hilo including University of Hawai’i – Hilo Performing Arts Center, Kilauea Drama and Entertainment Network, Hilo Community Players and The Palace Theater. This includes directly providing continued hands-on support, theatrical resources and monetary donations. Worked on every Palace musical production since Gypsy in 2004, as well and many other Palace productions over the years. As a community theater activist and advocates; I have also designed and built sets, provided sound effects, stage managed and performed in countless productions with all of the above named theater groups, and then some.